Big thanks to DataPlayed for creating Ad Patrol and pursuing socially relevant gaming as a tool for real world change. As well, thanks to Clay Ewing for coining the term "casual activism" to remind ourselves that in today's day and age, being an active citizen doesn't have to be all that active. Casual Activism takes on the illegal billboard problem in NYC: Call for Volunteers!!!! New York City has a host of problems that would be much easier to tackle if the city could just get their hands on a bit of data. For instance, which of the many thousands of billboards in NYC are illegal? Who owns them? and where the hell are they? The problem is New York City doesn't have the resources needed to collect such a vast amount of information. If they could, hundreds thousands of dollars in fines could be levied against law breaking companies, and what once seemed like an overwhelming task could be brought under control. Welcome to Casual Activism and a fun way to crowd source vital citywide data collection. We are looking for 100 volunteers to play a simple iPhone game called Ad Patrol for 1 month, starting April 1st. Volunteers will be asked to photograph billboards with thier smartphone and input company names. That's it! In the process volunteers will be helping to create a vast network of data about NYC's billboard inventory which will then be shared with any relevant parties including the NYC Department of Buildings. New York City has an illegal advertising problem. An illegal ad can be fined up to $25,000 a day, yet these fines are rarely collected. Outdoor advertising companies are able to skirt the laws and regulations put in place by the city for three reasons: ads are everywhere, documenting wrongdoing is an arduous task, and many people believe that illegal advertisements are in fact legal. 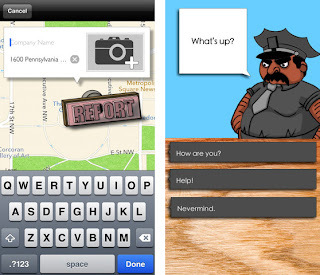 Ad Patrol is a mobile game that attempts to address the shortcomings of current law enforcement for illegal advertising. Using permit data from the Department of Buildings, the game maps out legitimate advertising in the city and then turns policing into a casual game experience. Players seek out new and existing ads to claim them for their own. To claim an ad, a player takes a photo and documents the company being advertised. The address and geo coordinates are added automatically and the data is submitted to a central repository. This central repository exists as an open data set with a programming interface (API) that interested parties, such as the Department of Buildings, can access. When a claimed ad has not been photographed in the last 24 hours other players can claim it for themselves, creating a method for obtaining evidence that adheres to a timeline. A similar effort to document illegal advertising in San Francisco took a team of 4 people 2 years to complete a similar task. By crowd sourcing the effort, this game has the ability to rapidly document unpermitted and illegal advertising at an unprecedented rate. While many activists might use the latest mainstream platform, such as Twitter, for a campaign, they are ultimately stuck with all the caveats of the existing system, its policies that affect access and ownership, as well as the firehose of existing information. The simplicity of the evidence (time stamped geo-tagged photographs with a description), combined with a flexible narrative allows the initial game to be repurposed for a variety of activist causes with minimal effort. The platform created for Ad Patrol, as an open source project, allows activists to tap into the power of crowds and create a single stream of information specifically suited for their needs.